Obviously, as with all historical work, one is limited by the sources available. Traditional music leaves very little in the way of written records, and any research project will leave tantalising gaps in the information which cannot be filled. Nevertheless, if the effort provides any insights at all it is surely worth it. 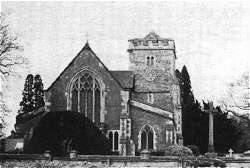 A second and briefer account of Turner is contained in a letter from C J Lucas, a member of the local gentry and churchwarden of St Margaret's, Warnham, to the redoubtable Canon K H MacDermott, in 1917. 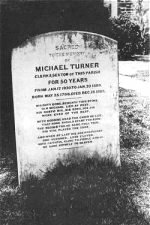 'It was then proposed and recommended that a vote of thanks be conveyed to Michael Turner for the Satisfactory and business like manner he has carried on the duties of Parish Clerk for the last 50 years. Carried unanimously. The quadrilles are in five parts, different rhythms equating to the five sections of the dance. Here we are on much more familiar ground. There are some mysteries, but a good proportion of the tunes listed are still current or have been recently collected from traditional musicians, e.g. Off She Goes and Haste to the Wedding. Others are ubiquitous like College Hornpipe, The White Cockade and The Flowers of Edinburgh. Henry Burstow tells us that Rory O'More was in the somewhat limited repertoire of the Horsham Town Band in the 1830s. 9 Did Turner know these from memory or was there a third manuscript book that has failed to survive? Were they simply tunes suitable for dancing or did Turner know actual dances to each specific tune as he did with Pop goes the Weasel? The only items in the manuscripts which have been 'recovered' from traditional sources are as far as I know Jenny Lind's Polka, Pop goes the Weasel and La Tempete. Jenny Lind's is interesting in being a much more elaborate version than the traditional renditions I have heard, and possessing a third 'trio' section. This seems to have obviously been copied from print as do most of the tunes in the manuscript. The list of country dances remains a bit of a mystery. In his 1917 letter C J Lucas writes of 'the description of the rules for the various dances' (my italics) which he finds 'very amusing'. The use of the plural here implies more dance descriptions than just Pop goes the Weasel, and unless they turn up at some time we must suppose them lost. Unless, that is, Lucas referred to the printed collections which Turner possessed. Turner's printed books seem very unlikely for a 19th century fiddler to have, for among other, things he had a copy of John Playford's 1665 edition of the Dancing Master, Playford's Introduction to Music and Introduction to the Playing on the Viol and on the treble violin and Thomas Campion's Art of Descant, all of 1664. 10 If, as I suspect, Turner's musical literacy was largely self-taught, we have the extremely interesting phenomenon of a 19th century village musician learning from 17th century self-tutors. We do not know what, if anything, Turner made of Playford's dance instructions or the more courtly sounding tunes in the collection. Here we quickly enter the realms of speculation. The Turner collection and the information uncovered about his life probably raise more questions than they answer. I do not think it is possible to draw out any hard and fast conclusions about the things discussed below, but I do feel that the material supports certain provisional conclusions and hypotheses which may suggest lines of future enquiry and are therefore worth setting out. In the first place the Turner material and other evidence I have come across suggest a strong link between the church bands and traditional dance music. 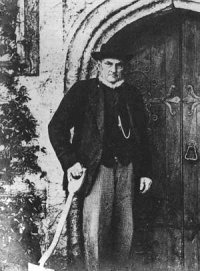 Everybody must be familiar with Thomas Hardy's accounts of the church band in Under the Greenwood Tree and Absent-mindedness in the Village Choir. The evidence suggests that the sort of relationship Hardy put into his fiction did in fact exist. 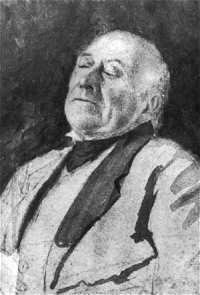 [Hardy was in a good position to write accurately about village music in the 19th century as he himself played the fiddle with his father for dancing and in church. Photocopies of the family tune-books, which resemble those described here in appearance and content, are available for study in the Library at Cecil Sharp House - Ed] Owing to the activities of MacDermott a fair amount of information is available on the Sussex church bands, and incidentally MacDermott gathered examples of secular tune books whilst engaged in researching religious music. In particular the collection of dance music that belonged to the Welch family of Bosham is a very rich source, and much more 'traditional' in content than the Turner manuscripts. A musician such as Turner might well have been important in the process of tune dissemination. There are a number of ways a new tune might get into circulation among rural communities, but one that seems quite likely would be where a musician like Turner copied a tune from print and then played it in his community where natural musicians would pick it up. Turner also seems to have taken the trouble to copy pieces he heard and liked. It is notable that four of the pieces in the manuscripts are attributed to Jullien. 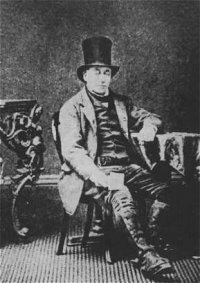 Henry Burstow informs us that 'Jullien's celebrated Orchestra, from London' provided the music at two fancy-dress balls in the Horsham area held in honour of a young gentleman who had recently come of age, in January 1844. 17 Perhaps Jullien sold copies of his music to the local gentry who attended the ball and one was lent to Turner for copying. The dates certainly tie up. The mention of Jullien's compositions in Turner's repertoire brings us to the vexed question of whether Turner can be classed as a traditional musician at all. Of course it depends entirely on how you define your terms. There is no agreed definition of the term traditional. Is traditional the form or the function? 18 Older generations of collectors and observers have paid attention to the formal aspects and ignored the functional; Lucy Broadwood did this when she chose only to take down certain of Henry Burstow's songs, those which conformed to her notion of what a folksong ought to be. 19 Here is not the space to expand my own views on the subject but briefly I believe that tradition is a social process connected with autonomous functioning of activities within known forms; the content of tradition, its formal aspect, is secondary to the role that tradition plays within a community, its functional aspect. This is not to say that the formal aspect is without interest, but merely that the functional aspect is of prime importance. 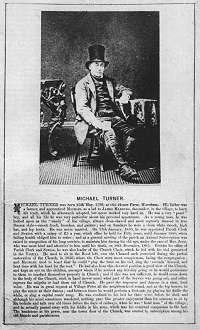 Michael Turner was a musician who spent his whole life within a small rural community, he led the church band, he played the music for the dances at fetes standing on a tub, and at big houses around the area, when called upon he would sing a song, and a great singer like Burstow was prepared to learn from him. This man in social function was a traditional musician regardless of the exact mixture of 'traditional' or composed pieces he performed. Finally, a study of Michael Turner directs our attention to sociological and institutional aspects of traditional music. I have already mentioned the supportive role of the church to musicians. Both Turner and Burstow were shoemakers; is this coincidence or is it significant? Both were great characters and in their ways individualists. In both cases bell-ringing formed an important social basis for the performance of their songs and music. 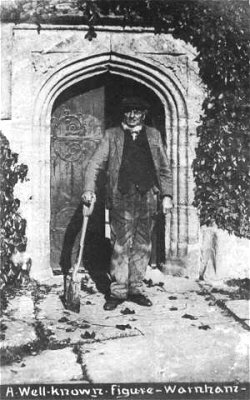 There are many sweeping and vague generalisations about the decline of traditional music in the 19th and 20th centuries; perhaps we should look much more closely at the changes within institutions that were supportive to traditional music and ceased to be: the church that bought Turner's fiddle strings in the 1830s ripped out the rood-loft and installed its first organ around the middle of the century. This was just one change among many in a rapidly changing society, but it may have vital significance. 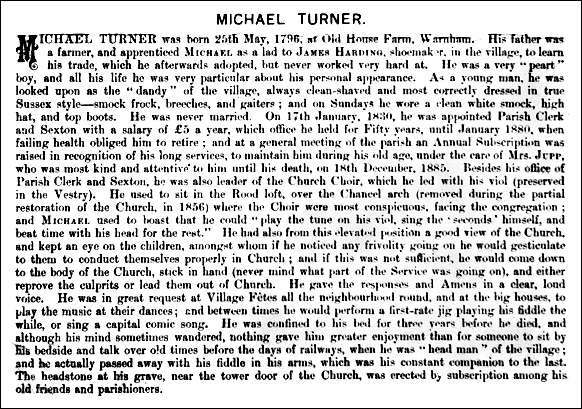 Turner fiddled out his 89 years, but I have found no information concerning a successor to his role as village fiddler. Turner's fiddle rests in a glass case in Warnham Church and Turner rests a few yards away in the churchyard; the village is losing its half-hearted fight against the invasion of modernity and mediocrity. What was once a thriving social centre is now a quiet backwater, an abode of the better-off type of commuter and the retired rich. This article first appeared in Traditional Music no.4, mid 1976, and is reproduced here with the collaboration of its author. The original publication appeared illustrated by pages from Michael Turner's manuscript books, which have not been retained here. The screen display of such items is notoriously poor, even when very clear originals are available to scan - not the case here, I'm afraid. They may be reinstated if I get access to better examples in the future - Ed. Thanks are due to Ashley Hutchings who first put me on to Turner, I think by reading a reference in K H MacDermott's Sussex Church Music in the Past; all the subsequent research is by me. Thanks are also due to the Revd B R Spence, Vicar of Warnham, who went through material in the church looking for information on Turner for me. He was also kind enough to allow the illustrations in this article to be reproduced.